With the release of Maps Marker Pro v4.0-beta2 we are getting one step closer to final release, thanks to all beta testers for your feedback! Please note that we are still optimizing the code during the beta phase. This version includes a fundamental change to the database, which means you MUST reset the database or run the data migration again if you updated from version 4.0-beta1. Warning: Please note that we are still optimizing the code during the beta phase. This version includes a fundamental change to the database, which means you MUST reset the database or run the data migration again if you updated from version 4.0-beta1. That´s it – now you can start using Maps Marker Pro v4.0-beta2. For directly downloading and installing the v4.0-beta2 package as zip file, please click here. If you want to use v3.1.1-beta1 again, please first deactivate Maps Marker Pro v4.0-beta2 and then activate Maps Marker Pro v3.1.1-beta1 again. 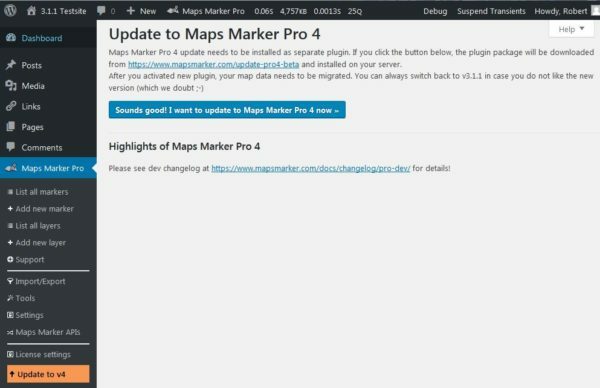 Please be aware that any maps which have been created with Maps Marker Prov 4.0-beta2 will not be visible with Maps Marker Pro v3.1.1-beta1, as a complete new database schema is used!